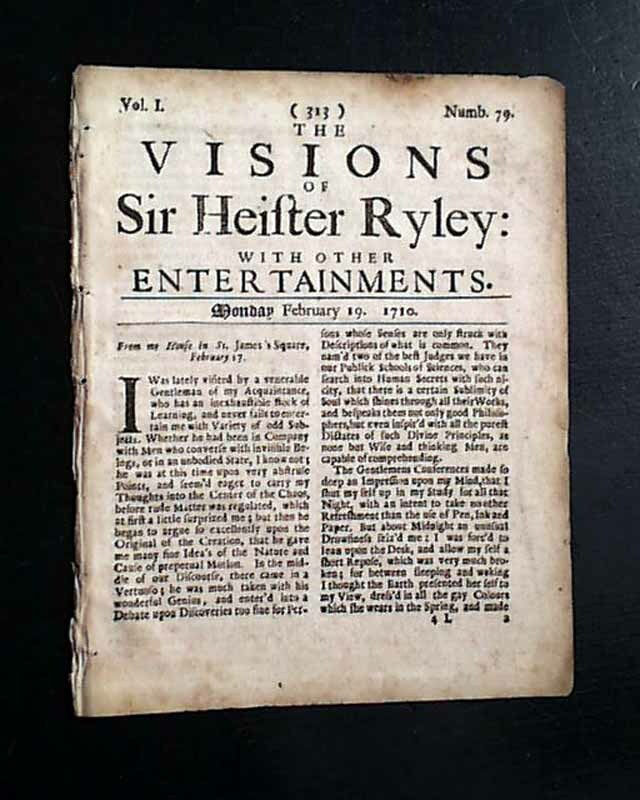 Item # 649279 THE VISIONS OF SIR HEISTER RYLEY: WITH OTHER ENTERTAINMENTS, London, 1710 Sir Heister Ryley, the fictitious editor of the Visions of Sir Heister Ryley, is a man interested in all fields of learning, a "stickler in the business of truth" and absolutely averse to siding with any political party. His little newspaper was a 4 page serial. It contained essays, letters and miscellaneous material which was datelined from such places as "From my house in St. James Square", "From London-Bridge", "From Gresham College" and the like. The newspaper was issued three times a week and lasted only eighty issues, being quite rare as such. Four pages, 5 1/2 by 7 inches, minor foxing, good condition.